An iconic tanning formula is now supercharged! 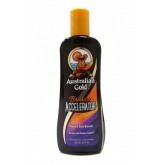 DHA and Natural Bronzers combine to provide amazingly..
Get your base tan the perfect dark shade in no time with the Australian Gold Dark Tanning ACCELERATO.. Enchant and entice with desirable color from Adorably Black! 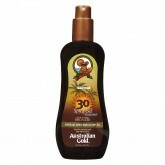 This 35X Delightfully Dark Bronzer blen..
Aloe Freeze Spray Gel provides cooling comfort to overexposed skin in a convenient, controlled ..
An iconic tanning formula is now supercharged with Natural Dark Bronzers providing instant, amazing .. Achieve an instant bronzed glow with natural black walnut seed and caramel Bronzers, while exotic oi..
Get dark color fast with Cheeky Brown® advanced formula infused with natural bronzers that give .. Dark color is no longer just a fling with this 20X Overindulgent Natural Bronzing Lotion, delivering..
Are you struggling to tan your legs? Kick your colour up a notch with Dark Legs bronzing power - for..
Do not underestimate the influence of the Dark Side™! 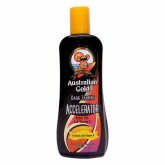 This 30X Relentlessly Dark Bronzer harne..
With native Australian oils and vitamin E, Australian Gold Dark Tanning Accelerator Spray's exotic b..
Have an evil scheme that involves turning to the dark side in the tanning bed? 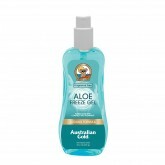 The Australian Gold D.. While it's true that no tan can last forever, you can dramatically increase the staying power of you.. 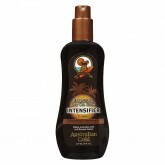 Formulated with Native Australian Oils and Vitamin E, this exotic blend delivers ultimate tanning in.. Think it will take you ages to get that dark black tan of your dreams because you're a tanning novic.. Extend the life of your summer glow! 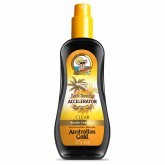 Natural Sunflower and Olive Fruit Oils seal in moisture for sil..
Are you looking for a tingle with the classic Australian Gold fragrance? Its time to turn the heat u..
15x deep dark bronzing power: caramel, monoi de tahiti, walnut shell extract, and other bronzers wor.. 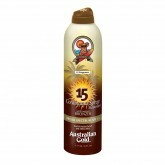 Bronze Sunshine Natural Bronzer is an exclusive combination of Black, Walnut Extract, Shea Butter an.. Bronze Sunshine is an exclusive combination of Black, Walnut Extract, Shea Butter and Vitamin E that.. 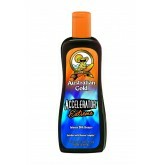 Achieve a golden color that positively shines! Paraben free and ideal for sensitive skin. 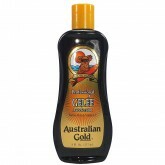 Key Ingre..
Australian Gold Broad Spectrum SPF 30 Continuous Spray Sunscreen with Instant Bronzer includes natur..
Australian Gold Continuous Sprays provide quick and easy application while ensuring even coverage. P.. Deeply nourishes and revitalizes for a silky, luxurious perfect tanning canvas. A blend of Hemp Seed.. Protect yourself from UVA/UVB rays while a natural caramel bronzer enriches your skin with an instan..